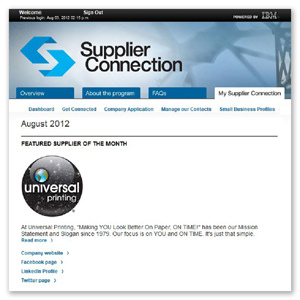 In August 2012, Universal Printing takes the national stage to become the Featured Supplier of the Month for Supplier-Connection, an economic growth initiative launched by the IBM International Foundation. From their website: “The promotion and growth of small businesses have been identified as crucial components to improving the economic vitality of the United States. Giving small businesses the opportunity to market their goods and services to supply chains of large companies could potentially serve as a key source of revenue to be leveraged for expansion and job creation. Supplier-Connection began as combined undertaking of six large corporations: AT&T, Bank of America, Citigroup, Pfizer, and UPS, with IBM spearheading the effort. Since their inception in October 2011, the likes of John Deere, Kellogg’s, Wells Fargo, and Dell joined a network of almost 400 registered buyers. Universal Printing joined the network of registered suppliers in April 2012 with an early entry into the April Supplier Spotlight contest (updates available through twitter as #Spotlight). This first outing resulted in an honorable 2nd place, losing by a single vote. Universal’s second attempt to be featured ended in a landslide 70% of the vote during the July Supplier Spotlight contest. We've been using Universal for 3 years now. We don't do many projects, but they always take care of our work with courtesy, knowledge, and professionalism. They make it easy to do business with. Great job! ?